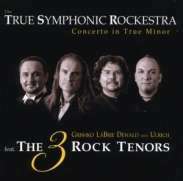 "True Symphonic Rockestra is an opera-oriented project founded by Dirk Ulrich featuring Dream Theater vocalist James LaBrie accompanied by opera tenors Vladimir Grishko and Thomas Dewald. The idea, dating back to 2000, was to get three world class singers to perform rock versions of the "best of" repertoire of the original Three Tenors (Luciano Pavarotti, Placido Domingo, and Jose Carreras) combining the operatic elements with metal elements. Finally, in 2006, this idea became a reality, as the recording for the first TSR album was completed in July. Their first album, Concerto in True Minor, will be released on March 28, 2008 on a new label, a cooperation between Brainrox Records (Germany) & Marisound Records (Russia), with Sony BMG taking care of the distribution in Germany, Austria and Switzerland. It will contain 21 songs."